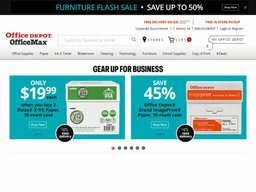 15% OFF + Extra $20 Office Depot Coupon - Verified 30 mins ago! For those that require a wide variety of office supplies and services at the very best prices, you have probably heard about Office Depot - the long running retail chain and online store that stocks everything you could want for the office environment. But what you might not know is that with a bit of support from our crew here at Coupofy you can knock even more money off your online purchase without barely having to lift a finger. That's right, our special deal hunters spend their days searching the internet to bring you all the latest Office Depot deals to this very page. So if you're looking for a regular Office Depot promo code to reduce the price of your order, an Office Depot free shipping code, or info on the latest promotions and sales, you will find everything you need here. Once you have browsed through our list below and found an offer you'd like to use, all you have to do is click the link to load all the terms and instructions on how to redeem it on the OfficeDepot.com eCommerce site. If you're not shopping here today and don't need any Office Depot coupons, then don't forget to check out all of our other offers. We have coupons and other deals for all the top online stores and service providers on the internet. Remember, as long as you come to Coupofy first, you are sure to make great savings whenever and wherever and whenever you shop! Details: Furniture Event! Save up to 40% on select furniture, plus Save an extra 10% instantly for Rewards Members. Apply code and Member ID at checkout. Having merged with Office Max in 2013 Office Depot remains one of the largest office supplies chains in the world, earning annual sales of over $11 billion dollars. They have around 56,000 employees, working in nearly 2,000 retail outlets, in over 50 countries. The online store is also a key driver of sales and can be easily access by North American customers at OfficeDepot.com. Here you can browse the categories to choose products for your order and then checkout in minutes for prompt home delivery, with numerous free shipping offers and other perks. This is one of the reasons the chain has become so popular, due to the number of Office Depot deals available. These are typically redeemed used a special Office Depot coupon for 2016, or whatever year it is. We maintain a list of these right here at Coupofy, so don't forget to come back before placing your order. Brand names and subsidiaries under the Office Depot name includes OfficeMax, OfficeMax Grand & Toy, Ativa, Viking, Foray, TUL, DiVOGA, and Realspace. F. Patrick Sher, Stephen Dougherty and Jack Kopkin, founded Office Depot alongside Staples, another office supplies chain in the 80s. They were all former associates of the Homeowner's Warehouse, which was sold in 1983. In just two years Office Depot went public on the stock market. Then in 1991 it merged with rival Office Club, before expanding in to Canada in 1992. By 1995 there were over 500 stores in operation, with licensing deals in Israel, Colombia, Poland, and France. The online store was launched in 1998, and you can make savings on your online purchases by redeeming Office Depot coupons. At Coupofy we have the most up to date list of offers on the web! Customers don't necessarily have to shop online for their merchandise needs however. They can simply visit the website and request a printed copy of the catalog instead or visit one of their many locations in person. 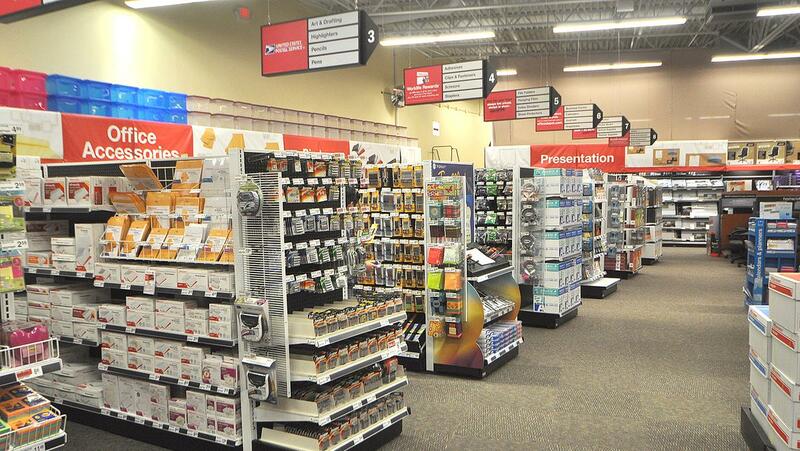 Office Depot provides the largest office supplies selection in the world. This includes: Cleaning chemicals, cleaning equipment, waste baskets and trash bags, hand soap and sanitizers, air fresheners, paper products and dispensers, Copy and printer paper, art and craft paper, cash register and thermal rolls, filler and graph paper, notebooks and pads, certificates and covers, photo and presentation paper and more. At any given time there will usually be one Office Depot discount code that can apply to items in any of these categories. Featured brands for ink and toner are Canon, OKI, Samsung, Brother, Lexmark, Dell, Kodak, Panasonic, Epson, HP. Breakroom items include single serve brewing systems, appliances, cups, plates, cutlery, water, soda, juice, first aid, coffee and coffee supplies, foods and snacks. Featured brands are Folgers, Dixie, KEURIG, and Nestle. Featured brands in the technology department are brother, Dell, Toshiba, and HP. Here you'll find printers, scanners, copiers, faxes, computer and tablet accessories, office machines, computers and tablets, software and books, monitors and projectors, data storage and media. Many of these will support the use of a Coupon for Office Depot. The furniture department has desks and workstations, furniture collections chairs and seating, bookcases, tables, training and panel systems, file cabinets, chair mats and floor mats and more. Featured brands here are realspace, WORKPRO, Thomasville, and SAUDER. School supplies has backpacks and lunch bags, presentation, teacher resources, paper notebooks and organization, student tech, arts and crafts and more. A Coupon for Office Depot is a great way to save on returning school supplies after the Summer or Winter breaks. Their copy and print section sports the My Print Center, marketing services, business essentials, cardfolio business cards, promotional products, photo services, business essentials, mailing and stationery. Before you purchase anything on the website, make sure that you check out the Office Depot deals section. You can make even deeper savings by applying one of our Office Depot coupons during the checkout process. If you are buying items for somebody else you can also purchase a gift card so they can make their own purchasing choices. These come in values of your choosing and can be delivered by email or post, to you or the recipient. They also never expire so you don't have to redeem them right away. Sales: Office Depot have a dedicated page and items in categories that are specially marked as sale, which mean they are discounted below their usual price for a limited time or until they sell out. All you need to do to get these savings is add them to your online cart as normal. Remember, nothing lasts forever, so if you see something in the sale you like be sure to buy it as soon as possible. Office Depot Promo Code: A promo code, coupon or Office Depot discount code, is just a random sequence of characters or a word that you can type in on the site to claim its associated special offer (usually a discount of some kind). Only one Coupon for Office Depot will work during one checkout, but if you use one in conjunction with certain sale items you can sometimes get even more money off. Check above for an up to date list to find a new promotion code for Office Depot or other useful deals. Free Shipping: From time top time you will come across two free shipping offers on the site. Firstly they might be running a Office Depot free shipping code that will eliminated the price of delivery regardless of the order size. Secondly the site automatically applies free shipping at checkout to qualifying purchases, so long as if you spend over $35 in one order. If a free shipping code for Office Depot is currently available you will see it alongside all of our others above. Office Depot Rewards: You are automatically enrolled in to the generous Office Depot rewards program when you register for a basic free online account. This program issues you points every time you make an order on the site, which correspond to the amount you spend. Once you have gathered a certain amount of points they can be cash in for a discount on future orders. This is done in much the same way as an Office Depot discount code. If you spend a lot you can move up the brackets and earn more points comparatively per order than somebody that doesn't buy a lot. New Customer Offer: If it is your first time you have been to the Office Depot website and you have never placed an order, keep your eye out for a popup or email with an exclusive deal. This will commonly come in the form of a small discount via a Office Depot coupon for 2016. Affiliates: Whether you are a professional online marketer or a customer looking for some side cash, by signing up to the Office Depot affiliate program you can earn commission on sales you drive. You will be given a special web link that tracks clicks and your role is to market the site via that link. Bulk Buying: Office Depot was built on bulk buying and they have always remained loyal to those that buy large quantities. In short the more of an item you buy the cheaper the per item price becomes. You may be able to find other Office Depot deals by joining their email newsletter, which is sent out regularly with sale info and other company news. You could also find a promo code for Office Depot by following them on social media, where they sometimes share them. They have profiles on Facebook, Twitter, Linked In, and Google Plus. Placing your online order and redeeming any Office Depot coupons couldn't be easier at the OfficeDepot.com web store. This caters to customers in the US only, so be sure to find your localized site if you reside elsewhere. Before choosing what to buy you are advised to register an account with your email and password. This will open up the site's full features, such as order history, tracking, and re-ordering, and also save your payment details after your first purchase to make things easier in the future. To help find what to buy everything is organized in to appropriate categories and subcategories, and if you have some keywords in mind or an item catalog number you can enter this in to the search bar, which is present at the top of every page. When you are on a page with a list of products these can be further refined and sorted by price, features, popularity, and other relevant filters, until you find something exactly for you. Then you should click through to read the more detailed description and view the photos of the item. There are also reviews and ratings left by other customers to help you make up your mind. The site uses as typical cart and checkout platform, so if you have ever shopped online before you will have no trouble here. Select your quantity, hit the cart button and when ready to checkout, hit the icon at the top of the page. Before you go to payment you will see a special promo box to enter your Office Depot promo code. If the code is still in date you will get a confirmation message and your order will update according to the terms of the deal. Note only one promotion code at Office Depot works at a time, so make sure to have a good look for the one that will make you the most savings! Ever searched the web for the "office depot near me"? Fortunately the site has a convenient store locator to find your nearest Office Depot, info on their special programs for the schools, the environment, and US military veterans. The majority of orders over $35 qualify for free standard shipping in the United States, which applies to over 700,000 products in the 48 lower US states. This takes between 3 and 5 business days to arrive. Alaska and Hawaii qualify for free shipping on 158,000 products and their delivery will take slightly longer. You can also pay extra for several expedited options. From time to time you can also make use of a free shipping code for Office Depot, which will get you your delivery for free outside of these standard terms. Office Depot supports all major credit cards, Paypal their own gift cards and store cards, which can be applied for and managed online. To save money on your order or redeem any other offer, you can enter the code from one of our Office Depot coupons in to the promo box just prior to payment. Office Depot operate a 90 day returns policy allowing you to return most items no questions asked, for a full refund or exchange, so long as the items are unused and in their original condition. All orders come with a prepaid returns label, the cost of which will be deducted from your refund, or you can return the order for free to your local store. Any refund you do get will obviously not included a discounted percentage applied with an Office Depot promo code. This includes an Office Depot free shipping code as well. Today's Office Depot Inc. was born out of the merger between the original Office Depot and OfficeMax corporation. This has helped make it the largest office supplies and related service provider in the world, catering to home offices, schools and all variety of workplaces, offering all access to an Office Depot promo code to get savings. "Office Depot, Inc. is a resource and a catalyst to help customers work better. We are a single source for everything customers need to be more productive," reads their about page. This includes the latest in office related appliances and technology, every kind of traditional office supply at the best prices, office depot printing and document services, facilitating businesses themselves, and everything from furniture and storage, to the whole gamut of products to keep schools running smoothly. According to the latest data Office Depot now makes over $14 billion in yearly revenue, from their tens of thousands of permanent employees, in 59 countries across the globe, from approximately 1,800 store locations - both standalone and within other establishments. The online store has received multiple awards just in recent years, and as well as serving individuals at the online and retail level the company operates as a powerful business to business sales force – delivering their services via a worldwide conglomerate of separate organizations, business franchisees, official licensees and contracted partners. Some of their own internal brand names include WorkPro, Realspace, TUL, Foray, Ativa, and HighMark. Companies owned by Office Depot Inc. include the Grand & Toy Canadian online office supplies store, UK based office supply mail order company and site Viking Direct, and OfficeMax branded stores. All of these offer some kind of Office Depot promo code to support their customers. There's no denying that judging from the above information, today Office Depot is an industry leader. However it wasn't always that way. When the first Office Depot store humbly opened its doors in 1986 even the enthusiastic founders F. Patrick Sher, the former chairman and chief executive officer; Stephen Dougherty, the president; and Jack Kopkin, the executive vice president - didn't envisage the heights it would reach. The original concept called for a large warehouse presence in Lauderdale Lakes, Florida, where customers could come and buy office supplies in bulk at discounted rates. Typically prior to this they would have to buy in smaller quantities at the consumer level or work out complicated deals directly with suppliers. The idea was so popular that just one warehouse was not enough, and they began expanding in a more traditional chain of stores across the country. One technique that was invaluable during these early years (long before the Office Depot promo code) was price matching. They promised to take the hassle out of ordering and reordering by guaranteeing the lowest possible price for that type of product. Customers would sign the card and not have to worry about hunting for something cheaper elsewhere. Home Depot had it, and in higher quantities than anywhere else. Their other method was to provide the broadest selection of every product available. There weren't just legal pads for example, there were legal pads in all conceivable sizes and colors. In some respects their popularity grew a little too quickly and Sher was unable top handle it. He cashed out early and in 1987 David I. Fuente took over as Chairman and Chief Executive Officer of the company. In under a year he was able to take it public on the stock market, beginning the rise to the household name Americans and others know today. With a fresh team of executives and his own vision for the future, Fuente aimed for a national presence in all major states. In under 3 short years he was able to expand to 173 store locations, based in 27 states. By the following year Office Depot inked a strategic deal to acquire The Office Club, immediately rocketing them to become the biggest office supplies firm in the entirety of North America. One element of this were their inroads in to Canada through their acquisition of The Great Canadian Office Supplies Warehouse Chain in 1992. This also gave them a leg-up overseas in countries like Columbia where the chain already had a presence, giving their first taste of international success - something the executives would continue to pursue strongly in the years that followed. One of their other early international markets was Israel, where they still have a number of stores today, including close to Gaza. By this time they were accepting traditional coupons, the precursor to the online Office Depot discount code of today. Beside this international expansion became further expansion at home, through the opening of new stores and acquisitions of other businesses. For example in 1993 they would acquire the Eastman Office Products Corporation and Wilson Stationary & Printing Company, marking their first foray in to the monopolized contract stationer industry. They essentially became the monopoly themselves by buying out a further 6 stationers by the end of 1994. These moves positioned Office Depot to take advantage of industry trends that would come to play a central role in the Company's success. They came in at just the right time when the demand for custom printed stationery and supplies took an upswing and new computer technology was expanding the field. This side of the business would also go on to accept a promo code for Office Depot when making orders. In the following years international expansion continued with new stores in Thailand, Hungary and Poland, between 1995 and 1998. They also saw joint venture agreements in Mexico with Grupo Gigante, and groups in France and Japan. 1995 also saw their overall 500th store open and the launching of their Business Services Division, which dealt with fulfilment and business requirements. The online store, which was originally known as B to B, first opened in 1996. Europe became the name of the game in 1998 when Office Depot acquired the mail order office supplies company Viking Office products, which also opened the door in Australia. This made them the largest provider of office products and services in the world, a title they have kept ever since. Also in 1998 they gave a stronger focus to their online presence as the rise in eCommerce had well and truly taken off. This saw them re-launch their core website as the more aptly named OfficeDepot.com, closely followed by one for Viking - now Viking-Direct.co.uk, the leading office supplies site in the UK and Europe. These included the use of an Office Depot promo code to entice customers. They soon realized that offering their services globally from the web could vastly increase sales and by 2005 they already had a web presence in 30 different countries and made over $3 billion in online generated revenue! Meanwhile the company was beginning to need a shake-up as its day to day operations became vast and every changing. The man for the job was Bruce Nelson, who replaced David Fuente in the year 2000 as CEO. As well as their outward image to the customer Nelson want to make the best possible experience for those that worked at Office Depot - one of his lasting legacies. He also oversaw the acquisition of Guilbert, S.A, a European office supplies superstore that dominated the online Spanish market. This made Office Depot twice as much revenue as they had been making at the time from the region. After flipping the Kids "R" Us chain from Toys "R" Us in 2004, Neil Austrian came on board as the interim Chairman and CEO and immediately oversaw two positive financial quarters, before passing the permanent reins to Steve Odland. He oversaw a number of interesting marketing agreements, that saw the likes of NASCAR racing showcase the brand, as well as the acquisition of Best Office Co., Ltd.; Allied Office Products, Papirius s.r.o., and AsiaEc. Around this time the corporation also pledged its commitments to the environment, introducing the “Green Book” catalog of environmentally preferable products and by joining the Green Building Council. In the following years new partnerships were formed with Netbizz Office Supplies in Singapore, AGE in Sweden, and bigboXX.com in Hong Kong, as well as a franchise agreement with M.H. Alshaya Co. in Kuwait. One of the last key mergers yet to take place was of OfficeMax. Rumors of this had swirled for several years before it actually came to fruition on November 5, 2013, creating the new parent corporation Office Depot Max Inc. This further cemented their place as the leading global provider of products, services, and solutions for every workplace. Interested in shopping with the company now? Well be sure to head back to the top of the page for the latest Office Depot coupons.